Learning Gets Wild at the Library! Last week T and I met our friends at the library to check out a new-to-us free summer event, a traveling animal education show by the Wildlife Learning Center! Wildlife Learning Center educator Alicia shows the audience that a “thumbs-up” is the appropriate response when we saw or heard something we liked during the show. Loud noises could scare the animals, so while it was an applause-free afternoon it was one filled with many more than just two thumbs-up! The Wildlife Center is a non-profit organization based in Sylmar (CA); its mission is to, “Provide sanctuary and lifetime care to wildlife in need and to educate the public to care about wildlife, the life sciences, conservation, and the environment we share.” Not only do they have a central facility for the public to visit (please see website for hours and address), but they also specialize in taking their show on the road and into area schools, community events, and in our case, yes, even libraries. The Wildlife Learning Center has had a relationship with the Long Beach Public Library for a few summers now, but this year was the first time we were able to get over, get wild, and see the show (in our case at the Los Altos branch). Alicia showed us the black tip of the desert fox’s tail, which is a marking that the species use while traveling in groups so they can find one another. The kids all got a chance to touch “Zig-Zag” the red-tail boa at the end of the show. T’s face shows how questionable he was at this idea, but his friend got right in there, which helped T see that all was a-OK. The show lasted about one hour and is run like a mobile show-and-tell classroom with a wide variety of live animals. They always try to feature two types of wildlife rescues: Animals that are indigenous to the Southern California area (i.e. animals found in local, natural settings in need of rehabilitation but then are returned to their environs once healthy and healed), and species that are recovered from illegal situations (i.e. animals being kept as domesticated pets and/or that have been illegally imported for sale over the internet or through other channels). In the latter case, most of the non-indigenous species either are moved to zoological societies that have room to house them or they remain housed by The Wildlife Center for educational purposes. Fun African tortoise fact: This species can live up to 150 years and grow to about four or five times this size. This is just a baby by those standards (about 20 years old I believe). “Will” is a desert fox. Fun fox facts: Desert foxes have very large ears compared to the rest of their body size. They help to keep their bodies cool in the hot desert, but they also are highly susceptible to the slightest bit of noise, which meant we had to remain exceptionally quiet during his appearance. Fun Argentinean Red Tegu fact: Tegus like “Sweet Cheeks” here come in a variety of species and colors. They are extremely abundant in their home regions, much like a squirrel is here. Fun red fox fact: Red foxes like “Delilah” here are the largest species of fox. Don’t worry about her scrawny appearance; she just happens to be shedding her winter coat right now. Fun European Tawny Owl fact: Try to keep your head still and just move your eyes back and forth. Note that Tawny Owls like “Newton” cannot do this but instead move their whole head in order to look around, even when making the slightest glance. Fun porcupine fact: Though many cartoons would have you believe differently, “Gus Gus” here cannot shoot his quills. Also, the white quills are “guard hairs” and act much like the whiskers on a cat would in that they help gauge the animal’s surroundings and/or if a predator is nearby. Fun African serval fact: Servals are extremely shy despite their sleek and strong appearance. In fact, this was about as close as we got to “Slade” during the show. He just didn’t want to come out either because of the large crowd, the noise, or both. Fun baby American alligator fact: Alligators like “Chompers” have much broader, rounded snouts than crocodiles, which are more pointed. Crocs also have more remarkable under-bites than alligators. The Wildlife Learning Center put on a show that was perfect for all-ages (kids and adults). Staff did a great job showing off and teaching us about all of the different animals, which in our case included an African tortoise, desert fox, Argentinean red tegu, European Tawny Owl, porcupine, African serval, baby American alligator, and a red-tailed boa. You can read the captions on a few of the photos above for some fun facts about each animal. Thanks to the Wildlife Learning Center duo of Alicia and Jarrod (sorry if those names aren’t spelled correctly) for teaching us such wonderful things about all of your beautiful, worldly creatures, great and small! A lovely volunteer read to the kids before the show at Los Altos library. Check out your own local library for upcoming story times and other family events like this. Most events are free! Don’t worry if you missed the show! There’s one more appearance by the Wildlife Learning Center this summer at Long Beach Public Library’s Brewitt branch TOMORROW Thursday July 25, 3 p.m. Also, speaking of animals, coming up at the Los Altos branch this Saturday there’s going to be a “Read to B.A.R.K. Dogs” event from 11 a.m.-to-12:30 p.m.; B.A.R.K. stands for “Beach Animals Reading with Kids,” and this program is held every 4th Saturday of the month at this location. You can go here for more information on other FREE upcoming summer events with Long Beach Public Library and here for other future events in addition to the summer programs. 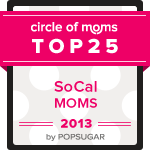 There’s less than one week left to vote “Real Mom Time” as a Circle of Moms 2013 Top 25 Mom Blog in So Cal! You can do so by clicking here to vote directly; or, if you want to see the whole list, click the button above and scroll through and find me to vote next to my spot on the list. You can vote once daily (every 24 hours) through Tuesday July 30 at 4 p.m. Thank you so much!